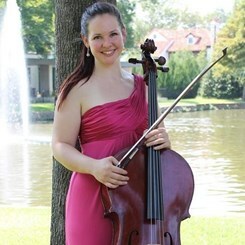 Kathleen McDowell attended the University of Texas at Arlington where she studied with Dr. Elizabeth Morrow and Dr. John Burton, and recently received a Bachelor of Music degree in Cello Performance. Kathleen served as the Principal and Assistant Principal cellist of the UTASO under the direction of Dr. Clifton Evans for 5 years. During her time at UTA, Kathleen received the Vic Issa Memorial Scholarship, the Daniel C. Burkholder and Tom J. Vandergriff Scholarships, and was awarded scholarships from the Sigma Alpha Iota organization for several years. Kathleen was a participant in the Texas Christian University Cellofest and has also participated in master classes by Castro-Balbi, Emily Wright, Benjamin Whitcomb, Michael Mermagen, and Phyllis Young, as well as a chamber master class by the Wyeth String Quartet of the Fort Worth Symphony. In 2009, Kathleen had the privilege of performing at the American String Teachers Association national conference in Santa Clara, California as a part of Quartet Canzona under Dr. John Burton. Kathleen has been among the faculty of the Texas Cello Academy where she taught private lessons and coached cello choir. She was a founding member of the Locrian String Ensemble, a chamber group dedicated to the March of Dimes Foundation. She has taught privately in the metroplex and performed with Serenata Strings for several years. She is working as a professional cellist in the DFW area, where she has performed with the Mesquite Symphony Orchestra and was awarded the Angela Nimifaa Scholarship, and has also played with the Allen Philharmonic, Northeast Texas, San Angelo, and Waco Symphony Orchestras.